Autumn is here! 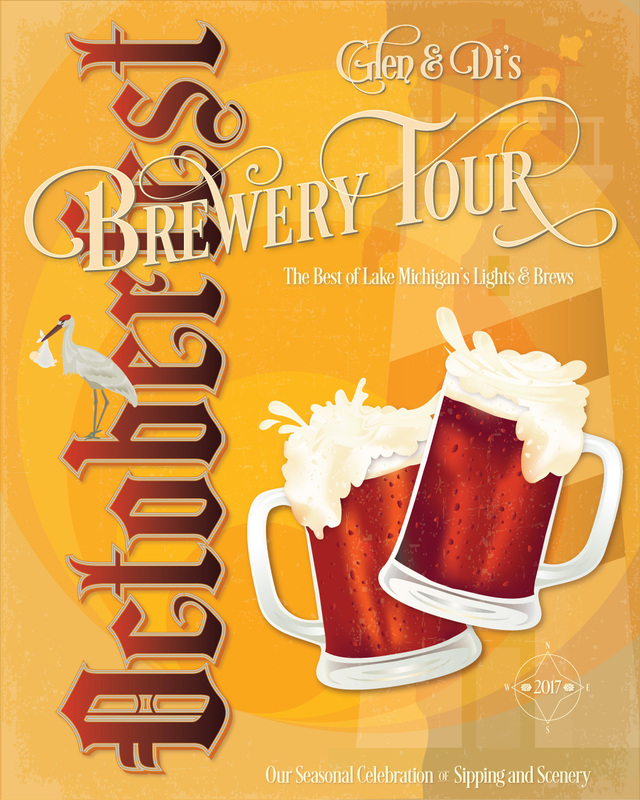 That means Oktoberfest beer has been out for weeks and we’re finalizing plans for our Octoberfest Brewery Tour. With that…drumroll… comes the release of my Octoberfest poster! The great thing about personal projects is that they can be just that—personal. Yes, commonly graphic design is communication to a full audience, but these Octoberfest posters are meaningful mementos of what’s become our annual tradition. Unique tours. Unique posters. And…did you notice this year’s stork? This October we’re minimizing our travels to within a 200-mile radius of home. As you might guess, we’re expecting a baby in the upcoming month —grandbaby, that is. Sipping beer may be fun, but nothing beats the arrival of a new child of God. One mention of contractions and we’re heading home faster than beer foams from a tap. Pending no news of labor, here’s our shoreline excursion. 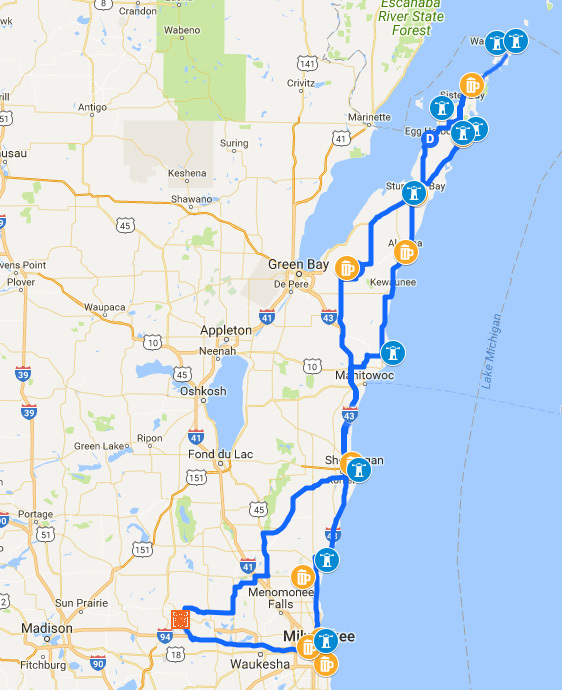 We’ve often vacationed in these parts of Wisconsin so I explored the internet for things out of our ordinary. Added to our to-do’s are Grafton Stone Mill, White Cliff Fen and Forest Nature Preserve and Rock Island’s Pottwatomie Lighthouse. Thumb Knuckle Brewery just opened this spring and seems like a perfect welcome into the Door County peninsula. Ahnapee Brewery is a throwback to the original 1800s Ahnapee Brewery except now it’s a tap room in a garage—a tiny garage—how cool is that? Plus Von Stiehl Winery is right next door. The Fermentorium—love the name—received good reviews from Milwaukee Magazine. It’s just outside of Cedarburg, always an interesting town. St. Francis Brewing Company: Their beers are showing up in several area restaurants and one of my favorites is the brown ale Sloth (which is definitely what I’ll be after this tour). Any more suggestions for this area? Let us know! We love the serendipity of life! LOVE this new poster and hearing about the upcoming vacation – that in itself is inspiring awesomeness! Lots of love and have FUN! and CONGRATS on the next grand baby!!! Thanks, @DancingonSunshine. Love this name for you, so fitting. Also love your blog https://www.bylaswithbrio.com. Blessings!